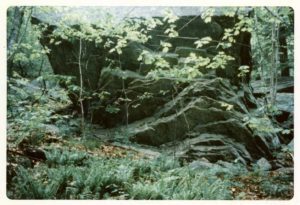 Woodruff Cave is a rock shelter site located in New Preston, Connecticut near Lake Waramaug. The site was occupied during the Woodland periods from about 1,000 BC- 1600AD, mostly during the Middle and Late Woodland periods. The site is significant because excavators felt it represents a mostly undisturbed rock shelter with exceptional preservation circumstances. This was based upon the large amount of faunal remains that were recovered from the habitation area. Blasting, undertaken in the area around 1900, destroyed about 80% of the original overhang of the shelter and disturbed a portion of the site, and impeded some of the excavation. The preservation was exceptional, however, due to the large amounts of faunal bone and shell material that were recovered from the excavations. 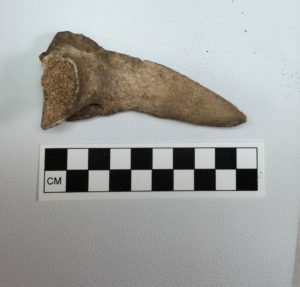 In general, Connecticut has very acidic soil, and so archaeologists do not often find good preservation of bone and other perishable objects. Woodruff cave was an exception. The excellent preservation of faunal remains at the site provided a large amount of information about what people were eating during this time period. When bone is buried in the presence of shell it is better preserved due to the calcium found in shell. 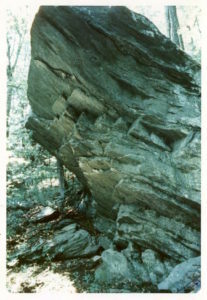 The rock shelter contained enough different types of faunal remains to argue for occupation during all seasons of the year. Identified faunal species included deer, elk, clams, and mussels. What is notably absent from the site is antler, this can be interpreted that the deer had already shed their antlers before they were hunted and processed by the inhabitants. This provides us with the information that the surrounding area was a good hunting ground. Elk are no longer found in Connecticut but their remains have been recovered from Woodruff cave, which provides information on the diet of the inhabitants and the game available in the area at the time. Since the site was a large feature on the landscape it would have been a well known spot to inhabit. 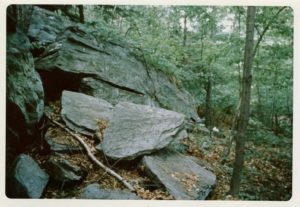 Rock shelters are useful because they are locations that are ready to inhabit with relatively little modifications being made. A person or group could come to the area and stay in the protection of the shelter overnight or for a more extended stay. It makes sense that people would have lived there during different seasons of the year. Possibly the most significant artifact is the pottery recovered from the site. Some of the pottery is decorated in the St. Lawrence Pseudo-Scalloped style. This is a style, characterized by a scalloped edge decoration produced by a tool rather than a shell, is usually found much farther north, in upstate New York and in Canada. The presence of this pottery style at Woodruff cave indicates that the people living there were in communication with indigenous communities farther north. This relationship may have been in the form of trading partners who also shared ideas, or kin, with intermarriages solidifying alliances between the communities, or both. Woodruff cave yielded thousands of artifacts spanning a large length of time. Edmond Swigart who lead the excavation speculated that the cave likely had deeper layers dating to much older time periods, however the blasting which destroyed part of the overhang of the cave made it difficult for the excavators to reach lower depths. This is an example of loss of archaeological information resulting from later human influence on the landscape. 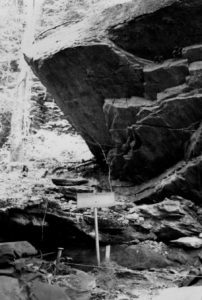 The information recovered from Woodruff Cave provided archaeologists with information on the diet of the Woodland Period and further evidence for early pre-colonial trade networks in Connecticut.